In 1987, the active chapter Alumni Secretary Greg Karmazin '87 wrote Tom Harmon '41 and invited him to attend Founder Day Dinner 1987 at which Chris Brewster '87 was recognized for winning the PDT GHQ's 1985-86 Harmon-Rice Award. 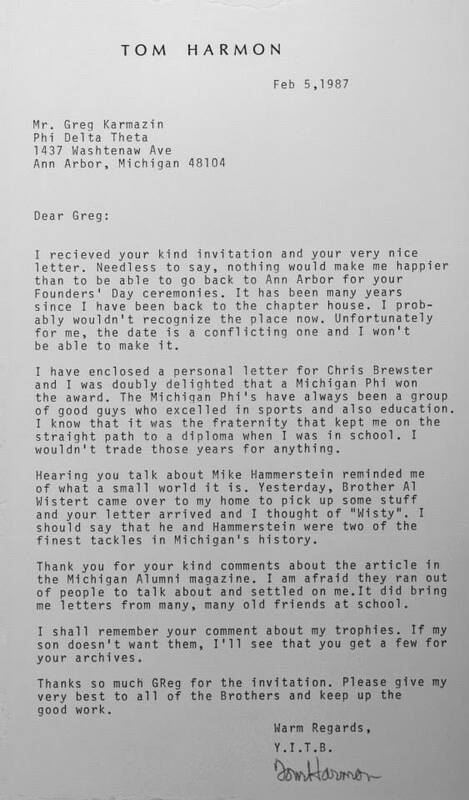 Harmon declined to attend, but wrote this very thoughtful letter and sent Brewster a signed letter that the active chapter framed and presented to him at the Founders Day event. Harmon states in this letter, "I know that it was the fraternity that kept me on the straight path to a diploma when I was in school. I wouldn't trade those years for anything...Please give my very best to all of the brothers and keep up the good work." His words show that he cared a great deal about Michigan Alpha and enjoyed his time as an active in the fraternity.